There are two ways of spreading one's light: to be the candle or the mirror that reflects it. 1. Deserving of the highest esteem or respect: Dependableness at completing his assignments was Jack'a most admirable quality. 2. Inspiring approval and admiration: The TV documentary did a more admirable job of showing what actually happened than what the government reports did. 1. In a manner to excite wonder, mingled with approbation (favorable opinion), esteem (high regard), or veneration: Marian took care of the complicated situation admirably. 2. A reference to someone deserving the highest regard and loyalty: Sally's father admirably supported his family by working at two jobs. 1. A feeling of pleasure, wonder, and approval about someone or something: Henry earned the admiration of his coworkers when he was able to get the results that no one else could do. 2. An object of wonder and reverence; a marvel: All of her friends have a great admiration for Mary's courage in accepting the dangerous assignment in the city that was being attacked by the terrorists. 3. The act of looking on or contemplating with gratification: Shirley regarded her supervisor in admiration for his efforts to keep everyone on the job and not laying anyone off even in these difficult economic times. 4. Etymology: from Middle French admiration or directly from Latin admirationem, admiratio, "a wondering at"; the noun form of admirari, "to admire"; from ad-, "at" + mirari, "to wonder" which came from mirus, "wonderful". Relating to or expressing generosity, approval, or awe: Joe showed his admirative generosity by helping the couple through their financial crisis. Regarded with awe and delight; highly prized: Mark Twain was an admired author for his writing skills. Steve's mother was an admired person because of the way she took care of her children during the flooding of their home. A person who honors, respects, or commends another person or people: Scarlett had many admirers who went to the concert and applauded her performance as a violinist. With rectitude and adoration: Norbert looked at his wife admiringly after her speech was over. Fred and Francis glanced admiringly at the beautiful scenery as the train went through the valley. 1. Someone who, or something that evokes surprise and astonishment: The Smith family members were very pleased by the marvels of the food that was available during their trip to Argentina. 2. A person who does wonderful or amazing things; especially, someone who is very skilled in doing something: The audience couldn't help but get excited about the marvels of the children's musical presentation. 1. To be revered, overwhelmed, and astonished: The tourists marveled at the magnificent beauty of the wonderful animals and natural scenery during their African trip. 2. Etymology: "to be filled with wonder"; from Old French merveillier, "to wonder at, to be astonished"; altered from Latin mirabilia, "wonderful things"; from Latin mirabilis, "wonderful, marvelous, extraordinary"; from Latin mirari, "to wonder at". 1. Extraordinarily wonderful and very pleasing: People thought the author had written a marvelous book for anyone who wanted to improve his or her language skills. 2. Extremely good, enjoyable, and fantastic: The graduating students had a marvelous time at their school party. 3. Heavenly, divine, magnificent: John is very thankful for the marvelous guidance and solutions of problems that have occurred in his recent life! © ALL rights are reserved. 1. Extremely well done: The singer marvelously presented his songs for the audience. 2. Wonderfully; strangely; in a manner to excite miraculousness or surprise: For someone who is so young, Marian's musical skills are marvelously disciplined and enjoyable. 1. A cause of sensation; astonishing: The marvelousness of the waterfalls continually attracted visitors to the park. 2. Unusual as a normal occurrence; supernatural: Merlin seemed to experience a solution to his problem that he felt was an unexplainable marvelousness. 3. Of the highest kind or quality; notably superior: The marvelousness of the art exhibition was amazing because it was truly uplifting to the spirits of the visitors. The marvelousness that the pianist displayed was incredible; especially, when compared to the other contestants who played. 1. An event that appears incapable of being explained by the laws of nature and so it is held to be supernatural in origin or an act of God: There are many who have experienced miracles in their lives because of wonders that have happened which gave them unexplainably fortunate results in their efforts to achieve what otherwise was considered to be impossible objectives! 2. An effect or extraordinary event in the physical world that surpasses all known human or natural powers and is ascribed to a divine cause: Watching the desert bloom after a thunderstorm is like watching a miracle as life is bursting forth from the barren hills. 3. Any amazing or incredible occurrence: After a week of severe storms with rain and high winds, it was a miracle when dawn broke and it was calm, the birds were singing, and the sun was shining again. 4. 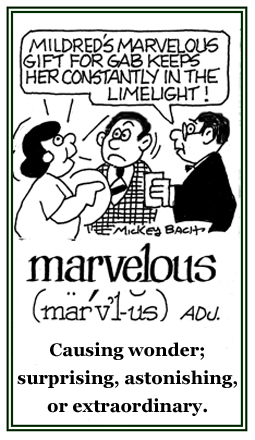 Etymology: from Old French miracle, from Latin miraculum, "object of wonder" (in Church Latin, "marvelous event caused by God"); from Latin mirari, "to wonder at"; and from mirus, "wonderful". 1. Performed by or involving an almighty power or agency; supernatural: After suffering in the hospital for several days with a bad heart condition, there seemed to be a miraculous cure of Adam's ailment when the cardiologist told him that he appeared to be normal again. 2. Of the nature of an astoundingly, awe-inspiring situation: Once Ina's friend had adjusted to her new hearing aids, she said it was a miraculous change in her life because she could now hear soft sounds; such as, the purring of her cat and rain falling on the roof of her house. 3. Having or seeming to have the power to work miracles: Dr. Sneed offered miraculous drugs for Sam's illness which actually changed his life from misery to feeling wonderful. Related "mirror" word families: catoptro-; eisoptro-; enoptro. A cross reference of another word family that is related directly, or indirectly, to: "miracle, wonder, wondrous": thaumato-.